President Mahinda Rajapaksa addressed the opening ceremony of the Global Services Forum Beijing Summit yesterday at the Great Hall of the People in Beijing, China. "As Asian countries transform to become service-driven economies, it is important that we work towards creating greater synergies," President Rajapaksa said in his speech. The President, who is on a four-day state visit to China, explained how Sri Lanka's economic development initiatives are closely linked to the reconciliation process undertaken by his administration. "Many leaders across the world acknowledge that economic disparities are a source for internal conflicts," the President said. "Aware of this fact, we in Sri Lanka are working hard to ensure that all the citizens of our country get equal economic opportunities." Highlighting Sri Lanka's strategic geographical location, liberal economic policies and political stability, the President said the services sectors are at the forefront of the government's strategy. 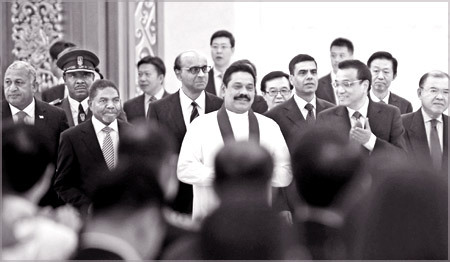 Speaking about the long history of China's economic role in the region and throughout the world, President Rajapaksa said trading with the Asian giant has been crucial for many nations throughout the ages. "The peaceful economic rise of China during the last three decades is a matter of great pride and satisfaction for all of us in the region," the President said. The Global Services Forum is jointly organized by the United Nations Conference on Trade and Development (UNCTAD), China's Ministry of Commerce and the People's Government of Beijing Municipality. It brings together key players from the services sector, governments, the business sector and the academia. This year's summit took place under the theme "Services: A New Frontier for Sustainable Development." The Forum took place on the occasion of the second China International Fair for Trade in Services (CIFTIS) being held at the China National Convention Centre. The Fair brings together leading service organizations from around the world. President Rajapaksa opened the Sri Lanka pavilion at the Fair by lighting the traditional oil lamp.